The best of John W Swinfield F.A.I.H.A. Excerpts from more than four decades of Australasian Sporting Shooter, Arms Cavalcade, Guns Australia, Etc. Calendar Girls - The months introduce action with MGs, SMGs, shotguns and more! Woman At Arms - An historical perspective from Queen Boudicea through the ages to Kurdish freedom fighters and armies of today. A look at movie heroines with an A to Z from Angelina Jolie to Uma Thurman and Zara Pithian. ​A history of the guns and the company that made them. A fantastic, rare old book. 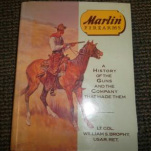 A must for the collector of Marlin firearms.